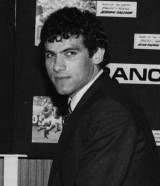 Anthony Joseph Patrick Ward , commonly known as Tony Ward, was a multi-talented sportsman who played international rugby and club football during the 1970s and 80s. Ward made his international debut against Scotland at Lansdowne Road on January 21, 1978 at the age of 23 and kicked to penalties and a conversion in 12-9 victory. He went on to help Ireland win the Five Nations Championship that year, scoring a total of 38 points, a record for a debutant. He won a total of 19 caps over the following nine years and accumulated a total of 113 points with his last appearance coming June 3, 1987 in a 32-9 win over Tonga during the 1987 Rugby World Cup. Ward also toured South Africa with the British and Irish Lions in 1980 and scored a record 18 points, 5 penalties and a drop goal, in the 26-22 1st Test defeat to the Springboks at Newlands. The Dubliner is also famously remembered as part of the Munster side that beat the touring All Blacks on October 31, 1978. He scored two drop goals and a conversion as the provincial side notched an historic victory - the first, and to date, the only success for an Irish side against New Zealand. Although better known as a rugby player, he also played football for both Shamrock Rovers and Limerick United. In 1981 he played for Limerick United in the UEFA Cup against Southampton and in 1982 he helped them win the FAI Cup. Since retiring as a sportsman, Ward has worked as a sports journalist and coach, most notably with the Irish Independent, and as a rugby commentator for Radio Telefís Éireann.